It doesn’t matter who we’re having or what we’re eating, if I’m cooking for more than our little clan, I just can’t get the amount right. Faced with a holiday dinner, I routinely make about twice what is actually required, sure that I may not be making enough. In my mind every guest is a 14 year old athlete with a limitless metabolism and elastic waistband. Thus our recent Thanksgiving dinner left us with a giant container of mashed potatoes in the fridge. Now normally I am just fine with lots of mashed potatoes around, but truth to tell I am the only REAL mashed potato fanatic in the house. Mr. Little Sis likes them, but can’t eat them for days and the kids are just not into them at all – there’s only so much a girl can do faced with all that mash. I hated to think of it going to waste… surely there is another way. While I could have made mashed potato pancakes, we’d had latkes just a few nights before, so no dice there. After being tired, cold, and a little lonely after the long weekend playing games and watching movies with the family, soup just seemed like the thing to do. 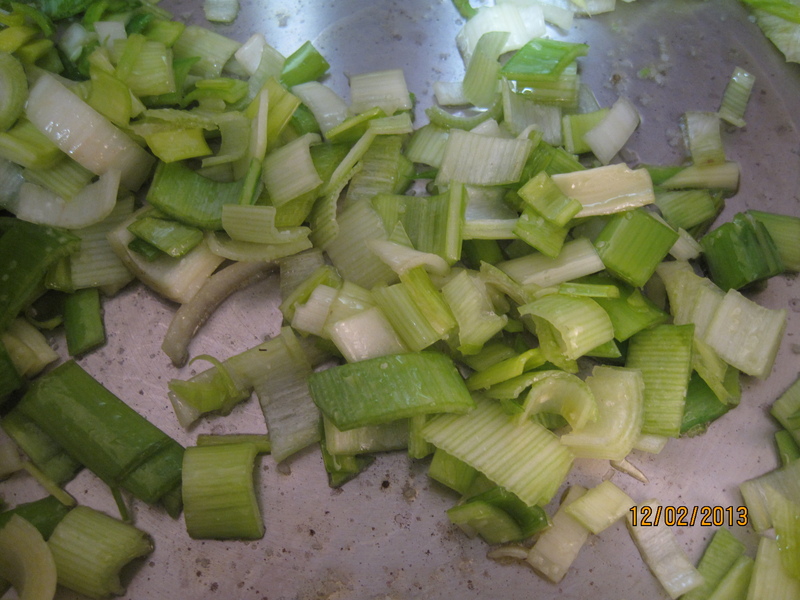 And what could be easier than making soup from mashed potatoes, especially if you have a leek. This really doesn’t merit a recipe, but I’ll write it out that way to make it easy to follow. You’re welcome. 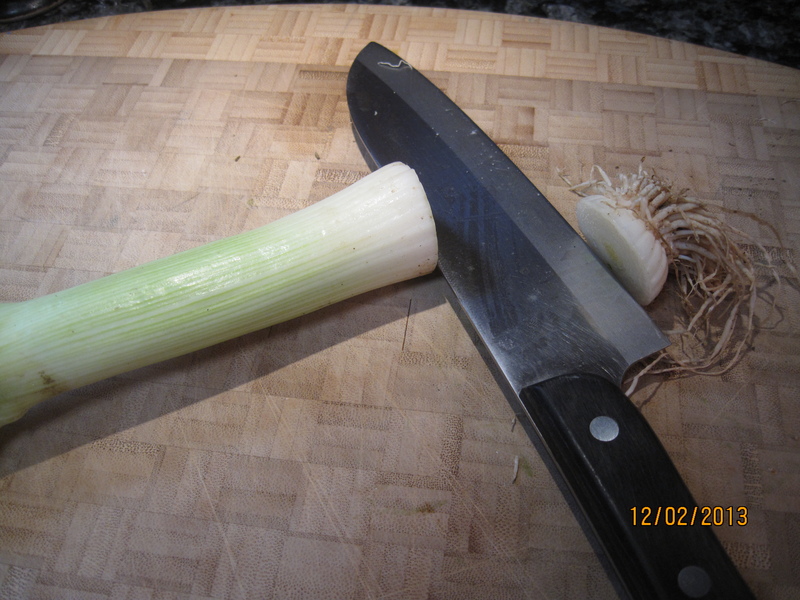 * Leeks are dirty little suckers. When they grow up through the soil, they bring quite a bit with them, trapped in the layers. Cleaning them can be tricky. 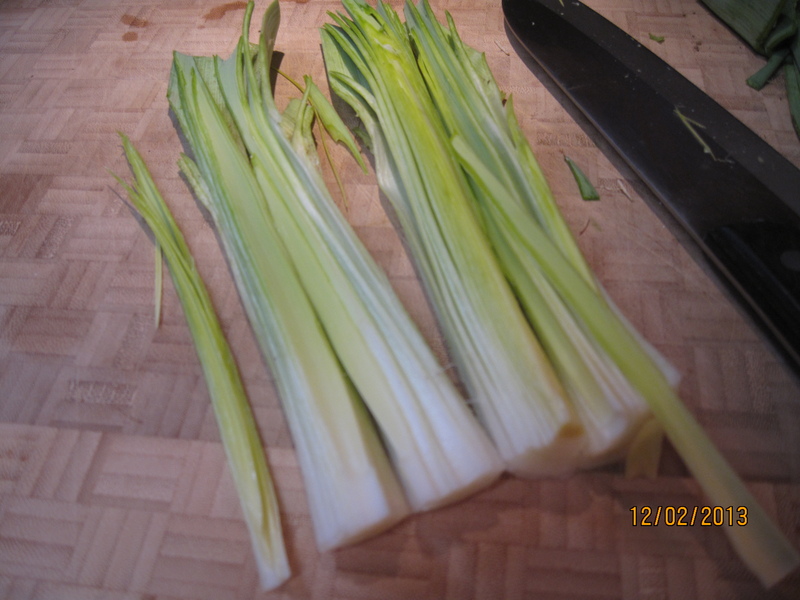 I simply cut the portion of the leek I intend to use into quarters the long way. I think place those quarters (they will separate – it’s okay) into a bowl of water, let them sit while I prepare other bits, swish them around and then rinse. Works like a charm, every time, and I learned it at fancy cooking school, so it must be right, right? 😉 I can say that the bowl of water is always cloudy and dirty – so it seems to do the trick. 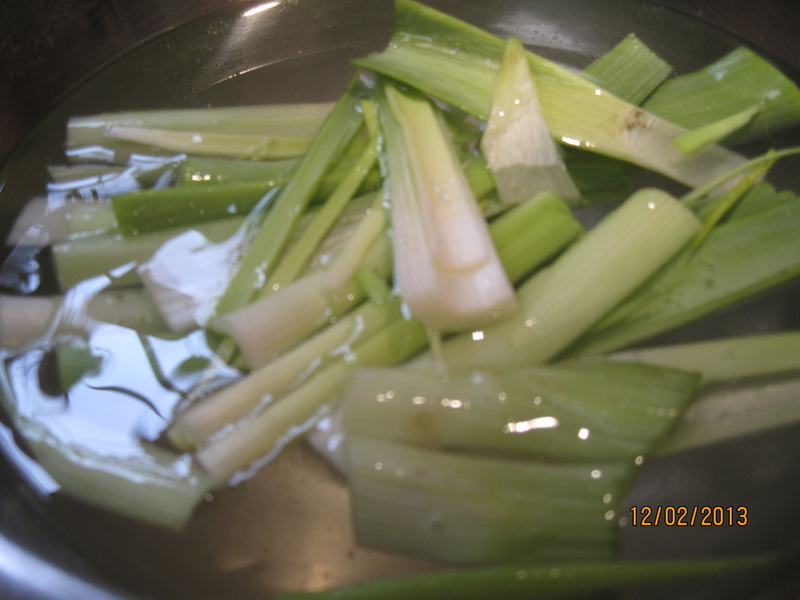 Warm olive oil in the bottom of a soup or stock pot, place chopped leeks and a sprinkle of salt in pot, sautéing and stirring occasionally until the leeks are tender and the white parts are a little translucent. Add the mashed potatoes and stir to combine. Add water and salt and stir to combine. Here’s where we’re gonna have some variation. If your mashed potatoes were perfectly cooked, had no lumps and were smooth as silk, you will only need to bring your pot of yum up to temp. If, like most of us, your potatoes were delicious but slightly less than perfect, you may want to bring the pot to a gentle boil to cook the potatoes just a little bit as the flavors mingle. 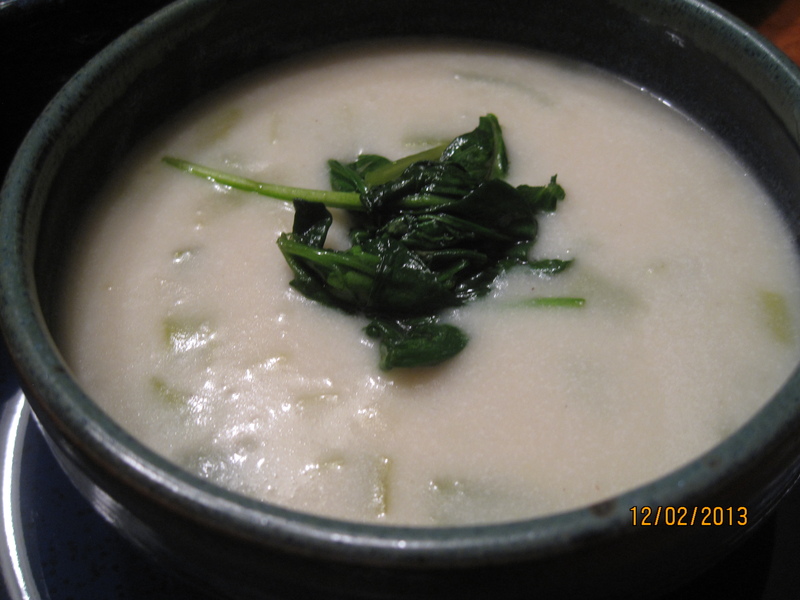 When potatoes have reached the texture you prefer, add the coconut (or whatever) milk and ground pepper. While the soup comes back up to temp, prepare the spinach. Warm olive oil to low-medium in a pan (I used cast iron). Add spinach, a sprinkle of salt, and the garlic to the pan. Turn/stir spinach frequently to encourage wilting throughout. When nearly all wilted, add the fresh basil. Stir for a little while longer. When all spinach is wilted and bright green, remove from heat. Serve soup with a few forkfuls of spinach, some lovely bread (ours was a non-dairy apple cheddar quick bread which I’ll share soon), and a salad. Delicious, satisfying, and a great way to use too much comfort food. Hope your holiday provided you with memories, laughter, and leftovers you love to eat over and over again. Love it when overdoing it works in your favor! Let us know how you like it! I did it- I made the soup! 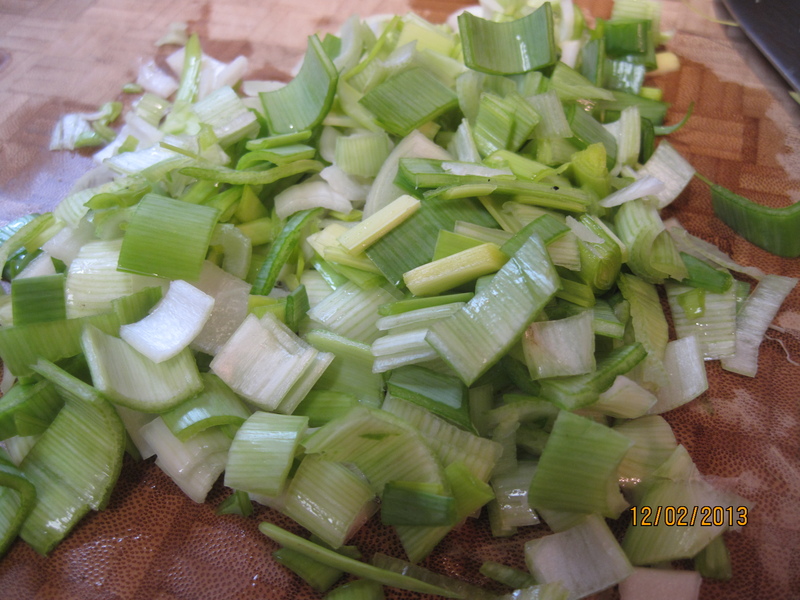 Before the leeks shriveled and gave up on me! Delicious, and definitely a great way to use up the old mashed potatoes! Thanks for sharing the recipe! Sheryl, it was fantastic and VERY warming. Hope you find a little piece of warm! This looks so yummy! I’ve never thought to make soup from mashed potatoes. Thanks for the inspiration! Stopping by from Thrifty Thursday. It really was delicious! Thanks so much for stopping by Sarah! Soup and winter just go hand and hand. I love making homemade mashed potatoes and now I know what to do with the leftovers. Thanks so much for sharing and for linking up to Thrifty Thursday. Thank YOU for hosting and stopping by Ruth! Enjoy your soup! This makes me hungry for a fresh bowl of potato soup. Thanks for sharing your recipe at Fabulously Frugal Thursday! Have a great weekend! 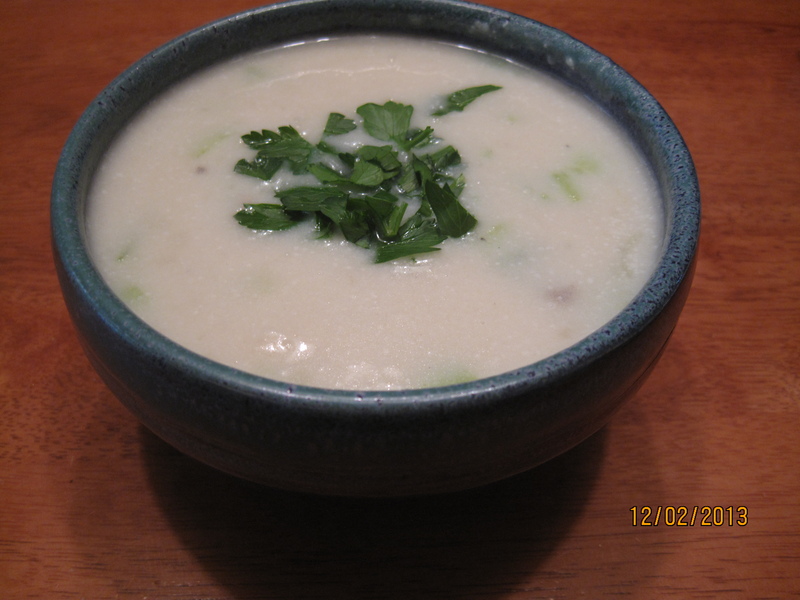 What a great solution for leftover mashed potatoes,we would just love this soup. Hope you are staying warm and cozy in this cold weather and thank you so much for sharing with Full Plate Thursday. I love smart ideas, especially if the help keep me from being wasteful. I’m going to try it!